You are here: Home / Recipes / Dinner / Mini Meatball Sliders Recipe! Mini Meatball Sliders Recipe! This sounds delicious. I don’t think when I was growing up we had what we called sliders. I do remember where I grew up we had Krystal burgers, which I LOVED! You could eat 5 in a sitting! If you have a White Castle near you then you pretty much have the same as a Krystal burger. They asked if they came with mayo instead of mustard… ummm… nooo – then it wouldn’t be a Krystal burger! lol THEN they scraped off the onions – I was over it! They ruined my excitement over sharing them! lol They will probably never eat another Krystal burger and I will never take any to them again! HA! Do you need a quick appetizer? I love using my slow cooker when hosting since it frees up the oven for other things. This is a very easy recipe for mini meatball sliders that can be easily adapted for ingredients you have. This is also great for dinner- my kids love them! 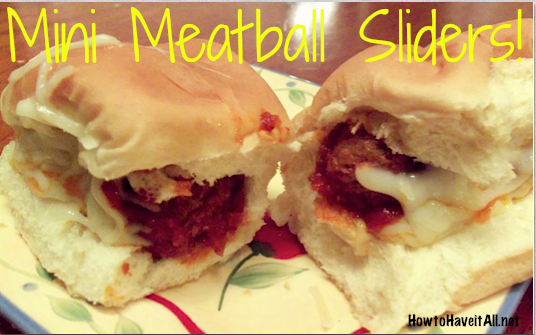 Renae’s Corner: Mini Meatball Sliders Recipe! Place the frozen meatballs in a slow cooker. Poor marinara sauce over top. Cook on high for 3.5 hours. Place two meatballs on each roll. Add cheese. Place under broiler to melt cheese. That’s it, there you have the perfect and easy mini meatball sliders recipe!